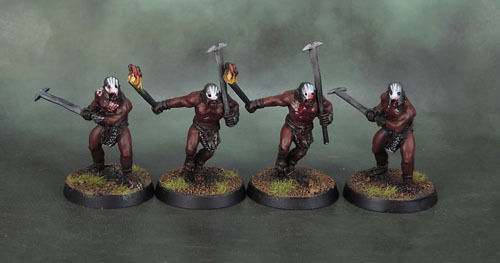 Uruk-Hai Berserkers of Isengard – Lord of the Rings: SBG (Squad: March ’18) | Azazel's Bitz Box. This entry was posted in Hordes of Isengard and tagged Lord of the Rings, LotR SBG, Strategy Battle Game, Saruman, Grima Wormtongue, Saruman the White, Uruk-Hai, Uruk-Hai Berserkers. Bookmark the permalink. Trip down memory lane there! I was around 12 when those first came out! As always, ace painting mate. Thanks Luke! Did you get into the LotR game at all? Fair enough! I collected a bunch when the films were coming out, and then a little bit of cherry-picking after that. When GW started their Southern Hempsphere trade embargo, I panic-bought a bunch more, and then it all sat in boxes until I started turning my Moria Goblins and Gondor guys into fully-blown armies for KoW. I’ve moved back to a lot more 40k lately, so the LotR stuff mostly sits in Limbo, but they still count for finishing off models, and the Battle Companies skirmish gaming looks very appealing. Hey, nothing wrong with panic-buying! So, have you got into the newer LoTR stuff? The Hobbit and all that jazz from GW? I need to change my approach to commenting on your figures! I think in future a plain and simple “like” will have to do for “absolutely bloody excellent figures” and that way I can save meself some time! Thank you – and honestly that’s how I feel about your scratch-builds! Kitbashing a space marine or something to represent another unit or something not available – fine. But your whole “they didn’t make this AFV in 20mm scale at the time, so I just MADE one. And then two more.” still blows my tiny mind. Excellent job, especially on the skin tones and your ‘flat metal’ technique continues to impress. Cheers! I think I might do a super-simple tutorial on the flat metal since a couple of people have commented on it now, and it’s SO simple to achieve. Next time I’m doing some appropriate blades and armour, I’ll take some pics. Always love a bit of blood. Did you freehand the white hands? They look cool man. Really nice mate – the skin tones are superb (as are the hand prints) and the BftBG works beautifully! Thanks Alex. It looks like I’ll b doing some more Isengard Uruks before too long. I’ll try for another unit during the next squad month. They might work as a little palette-cleanser amongst the other models. 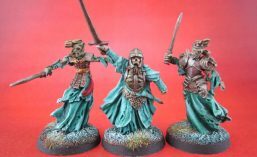 I really need to get a large horde of Isengard painted up. They do look pretty amazing en masse! Great skin tones. Did not know of this collection, and the work here is exactly what you’d want. Really impressed with the depth of colors on these. Glad to join you now in the squad challenge! Thank you Mark – the frogs came out rather excellently, and I’m glad you enjoy the Uruk-Hai. I’ll do a write-up at some stage on how I got the skin tones, as it was super-easy and should be simple to emulate for anyone doing similar models (or wanting a similar skin tone for anything else). Pingback: Citadel Uruk-Hai Berserkers: Unit-ed ORC-tober ’18 | Azazel's Bitz Box.